I don’t know about you, but coffee is a life essential at this point. Pre-kid I enjoyed coffee. I would sip it luxuriously in the morning with a fresh face and sparkling eyes. Now, with my sweet, little princess in tow, it’s all I can do to crawl to the coffee maker, try to stay awake while it’s brewing and then guzzle the first cup while attempting not to burn the inside of my mouth. Sound familiar? It’s safe to say, if someone tried to even take a sip of my coffee, first cup or fifth – it doesn’t matter, I might get a little cranky. My daughter tries to sneak a sip once in a while and I always give her hand a playful swat and say ‘Hands Off’. First of all it’s mine. Second of all, caffeine is the LAST thing my child needs! In fact, I need her natural energy in my cup of coffee! This mug was inspired by my ‘hands off’ approach to MY coffee. 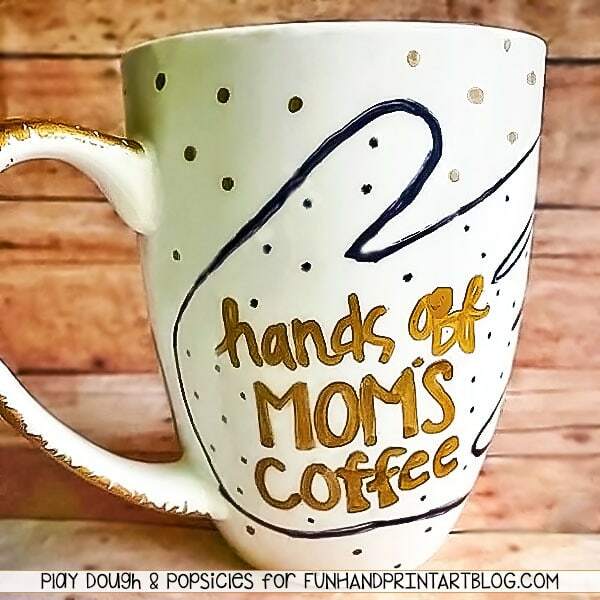 😉 I thought it would add a little sweetness to use my daughter’s handprint as a backdrop to the saying ‘Hands Off Moms Coffee’. Now everyone knows that it is Mama’s coffee and no one else’s. *This post contains affiliate links. You can read more about our disclosure policy here. Blank Mug – *I got this one at Walmart for around $2 but you can usually find them at dollar stores too. 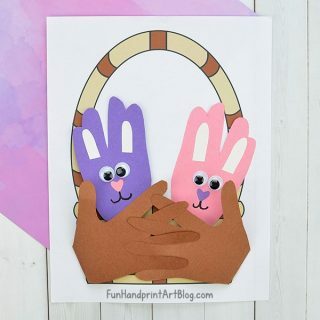 I started out by tracing my daughter’s hand onto a piece of paper and cutting it out. Next my daughter used a little glue stick on the paper to hold it to the mug. This is completely optional, but it worked perfect for us. 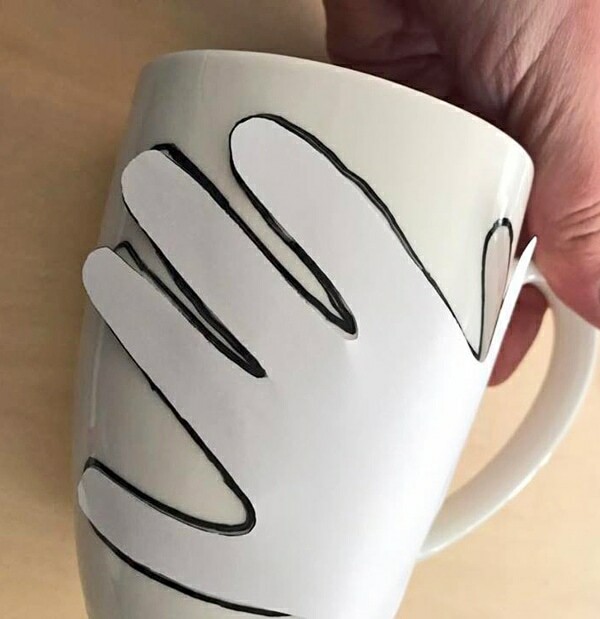 The glue surprisingly didn’t stick to the mug when we pulled off the hand template. You could trying using contact paper instead of the glue and paper. Next, we used the black oil based paint pen to trace around the hand template. Then I used the gold paint marker to write the words ‘Hands Off Mom’s Coffee’. My daughter had a blast using the gold marker to color the handle and add polka dots! The cool thing about the oil based paint pens is that you don’t HAVE to do anything else. It doesn’t matter if I was involved in making it, or if I played a major role in what I wanted, this ‘gift’ from my daughter will be my favorite coffee mug for years to come and a great reminder of how fast kids grow! If wrapping is your thing, I think this would be beautiful wrapped inside tissue paper and tied with a bow. If you need an idea for a personalized card, try this printable tri-fold card. 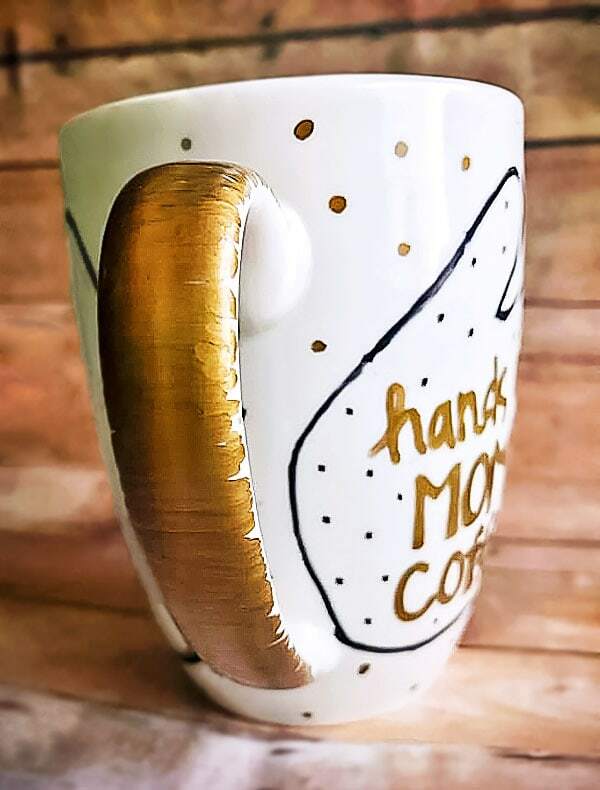 This handmade Mother’s Day coffee mug is such a simple gift yet can be a keepsake for years to come. Do you have a fun Mother’s Day idea? 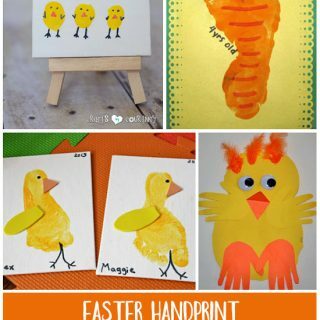 Check out this list of 50 Handprint Keepsakes to Make Mom for more inspiration!